Big 5 Sale Ad Circular valid April 21 – April 27, 2019. Big 5 Sporting Goods best deals, savings and sale on: Sportspower 14′ Trampoline with Safety Enclosure; New Balance 402v1 Men’s Running Shoes; Puma Tazon 5 Women’s Lifestyle Shoes; Nike Revolution 2 Men’s Running Shoes; Lifetime 50″ Fusion Portable Basketball System; Elite Fitness Deluxe Fully-Padded Inversion Table; Skechers Cross Court TR Men’s Training Shoes; Coleman Edgewater Sleeping Bag; Levi’s Hamilton 3 Hi Men’s Lifestyle Shoes; adidas EPP Glider Soccer Ball; Saucony Progrid Twister Men’s Running Shoes; Asics Running Shoes; Coleman Hiking Boots; Stiga Impact Table Tennis Table; Bearpaw Tatum Women’s Boots; Rawlings Comrade Bat Backpack; Easton Speed Brigade FS50 -10 Fastpitch Softball Bat; Rawlings 11″ Youth’s Fastpitch Series Glove; Nike Hyperdiamond Keystone Girls’ Softball Cleats; LA Gear Ventilator Women’s Training Shoes; and much more. 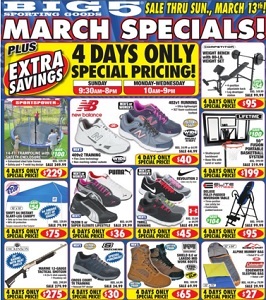 Find amazing deals, offers and prices in the latest Big 5 Sporting Goods Weekly Sale Ad Circular.